You are currently browsing the tag archive for the ‘Tale of Tales’ tag. 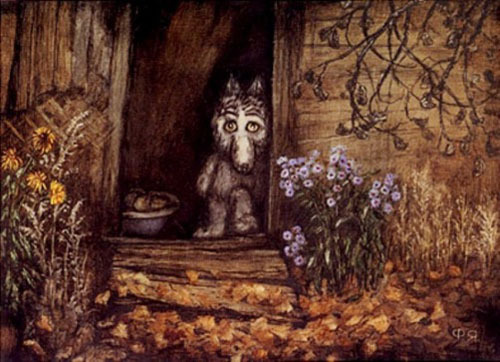 In ‘Tale of Tales’ we’re watching a wolf cub trying to survive his loneliness in an old house, relying on his memories. These images are altered with images of a river scene with a.o. a fisherman, his wife and his children, and a giant Picasso-like minotaur skipping rope. Two other recurring images are that of dancing wives losing their men to war, and that of a little boy eating apples in the snow. ‘Tale of Tale’s is regarded as Yuri Norstein’s masterpiece and as one of the best animation films of all time. This does not mean it is the most accessible of all films, on the contrary. ‘Tale of Tales’ is a poetic film, but a confusing one. The nostalgic images seem unrelated, and are shown in a non-linear fashion. In fact, it is very difficult to render a ‘tale’ out of the images, which are intrinsically very strong, especially those of the melancholy wolf cub and of the iconic river scene. Most of the film is made of muddy images in sepia-tones, rendering a dreamy atmosphere. Many images return, bridged by the wolf cub character, who, alone, seems to live in the present, outside of the images of a childhood long past. There’s some vague sense of a happy childhood being shattered by war and being lost in time. The film uses no dialogue, and even the music is timid in its evocation of mood. Some of the cut-out animation is superb, however, and the overall imagery one of great virtuosity. The end result is as beautiful as it is overlong and frustratingly incomprehensible.